For three generations, this family-run vineyard has been growing a unique selection of grapes along the shores of Seneca Lake. They have produced a number of award-winning wines in their 20-block vineyard and have been crowned the New York State Winery of the Year every year from 2010-2012. They’ve won 938 medals since 1992. Lamoreaux Landing Wine Cellars is passionate about sustainable viticulture and using harvesting methods for climate winemaking. Be sure to try their chardonnay and cabernet franc varietals. This new-age winery tasting room is housed in a historic barn that has added to the laidback yet rustic charm of this area. Immediately making you feel at home, Barnstormer Winery is a small batch winery that only sells their wine on-site. Begin your tasting with some of their European whites and reds, but don't miss their unique ice wine and port, styles that are a harder to find in this region. One of the more well-known wineries in the Finger Lakes, Hermann J. Wiemer Vineyard has an excellent selection of expertly made and full bodied wines. Wine & Spirits Magazine has named them one of the world’s Top 100 Estates, and the title is well deserved, as every wine has been produced and perfectly blended to be aromatic yet balanced. Go for the panoramic views of Seneca Lake, but stay to enjoy the exceptional wine at the Chateau LaFayette Reneau. With three Governor’s Cup Awards for his Rieslings, winemaker Tim Miller has developed a comprehensive selection of estate-grown vinifera wines that bring out both new and more traditional (try the Concord Mist) flavors of the region. For those looking to turn the tasting into a weekend, book your stay at The Inn Guest House at Chateau LaFayette Reneau that was originally built in 1911. Perched high on Torrey Ridge, Fox Run Vineyards has a perfect view their 55 acres of vineyards and one of the deepest parts of Seneca Lake. While having one of the larger tasting rooms along the lake, this vineyard’s relaxed approach to fine wine makes it an enjoyable experience for wine lovers and wine connoisseurs alike. Winemaker Peter Bell is committed to creating delicious wines while adhering to environmental standards. Take some time to also enjoy their stunning grounds or sip a glass on their patio. 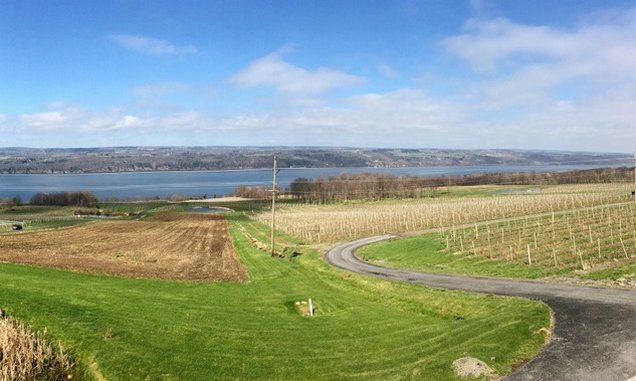 Located in central New York, the Finger Lakes is a stunning region that is home to over 100 wineries along 11 lakes. The area is known for producing some of the finest vintages of Rieslings and other varieties due to the unique microclimate found along the fertile land located beside the water banks. However this region can be quite expansive to drive though; it takes an hour to drive from the north end of Geneva to the founding father of Finger Lakes wine Dr. Konstantin Frank Wine Cellars. So, to keep the driving to a minimum and the wine tasting at a maximum, stick to the Seneca Lake Wine Trail, where the wineries are close together and accessible via scenic bike ride. Each one offers guests a relaxed atmosphere, affordable tastings and picturesque views of their vineyards overlooking the largest of the Finger Lakes, Seneca Lake. Note: Not all of these are on the official Seneca Lake Wine Trail but close enough that they should be. Caleigh Alleyne is a travel and lifestyle writer and editor of The Creators Commune.